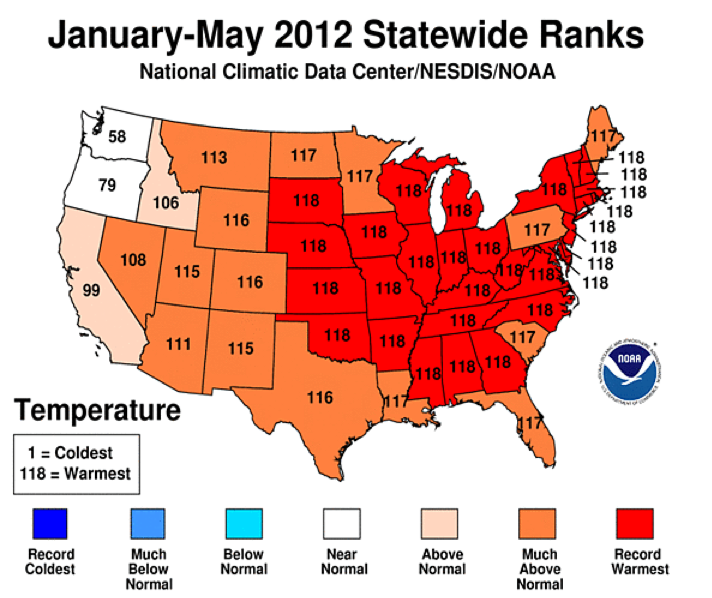 The first five months of 2012 were the warmest on record for many Great Lakes cities. Thirty-eight cities in the Great Lakes region knocked out serious long-standing heat records, according to the National Oceanic and Atmospheric Administration, which administers the data center. Nationwide, 104 cities set records. Statewide ranks for warmest states based on each state’s average temperatures for 2012. Photo: NOAA.gov. “Folks around the Great Lakes are around or within one of the most unusual temperature episodes that we’ve seen in the U.S. since we’ve been keeping track of things,” Arndt said. The unusually high temperatures in March caused fruits and vegetables in the region to start growing earlier. Unfortunately, the frost that followed the early spring start caused serious economic problems for farmers. Michigan lost 80 percent of its sweet cherry crop and 90 percent of its tart cherries because of the weird weather. Over the past 43 years, Michigan is the second fastest warming state in the country, according to a map from Climate Central, a nonprofit news and research organization that analyzes and reports on climate science. It used data from the National Oceanic and Atmospheric Administration to make the comparison. Minnesota is the third fastest warming state during that period and Wisconsin is fourth. Arizona is the first. Green Bay, Wis. had its warmest year since 1886 with an average yearly temperature of 41.4 degrees — a 7.1 degree increase from the city’s 1981-2010 average temperature. Sault St. Marie, Mich. had its warmest year since 1888 at an average yearly temperature of 36.4 degrees — a 6 degree increase. Peoria, Ill. had its warmest year since 1901 with an average yearly temperature of 48.7 degrees — a 6.6 degree increase. Evansville, Ind. had its warmest year since 1896 with an average yearly temperature of 53.8 degrees — a 6.2 increase. The data center also measured the unusualness of the temperature hikes for 2012, making it easier for people to understand how drastic the changes are. The unusualness is based on how much each city’s 2012 temperature deviates from its long-term average. Muskegon, Mich. has the highest unusualness rating of the Great Lakes record breakers at 3.6 and has an average temperature of 44.7 degrees for 2012. After Muskegon, the second highest unusualness rating in the region is 3.3 for Rochester, Minn. The lowest unusualness rating is 2.5 for Youngstown, Ohio. Nationally, 2012 was the second warmest spring on record at an average temperature of 57.1 degrees, exceeding the previous warmest spring in 1910 by 2 degrees. He compared the relationship between climate and weather to the relationship between a parent and a child. In the same way, long-term climate patterns influence day-to-day weather, but don’t have complete control over it. Despite the variability weather patterns give to climate change, Arndt is confident that the driving force of the heating trend is human-induced climate change caused by the burning of fossil fuels. “We broke a lot of records this spring and threatened a lot of records too. It’s likely that we will continue to threaten the warm end of the records way more often over time.” Arndt said. As we look to the future of the Great Lakes region, we can only anticipate worse conditions unless something changes now. Currently in every state, as well as in Canada, gas and oil companies are engaging in massive land grabs, and fracking initiatives are being undertaken in huge quantities. While there are efforts to stop fracking in each of the states and in CA, the sheer number of wells that are being installed, or are soon to be installed is mind boggling. New York alone proposes more than 100,000 fracking wells, while MI governor has already leased oil and mineral rights on more than 100,000 acres, with as many as 5.3 million more to be auctioned off in October. The federal government is also opening up some federal land for fracking, on top of what the state’s are allowing. Add to this catestrophic events that have already occured in PA, OH, MI, CA and other areas and we begin to get a picture of the urgency of the situation. Climate change can only increase as state and federal forests and preserves are cleared of trees, in order to make way for the gas fracking industry. The time to act is right now. Please visit stop fracking the great lakes international on facebook and help support the effort to save our land and water today. And soon Harold the U.S. will become a pariah among the advanced nations because we are regressing socially and intellectually. The extreme naysayers hold sway over an increasingly larger segment of the population. The anti-science ranters and the God will provide dreamers have gained credibility with our marginally literate groups and convinced them that what is obvious is not really happening. To make matters worse, politicians with axes to grind are catering to these groups to advance their corrupted agendas. I’m 70 now, hoping for another 10 good years, and I expect to see the beginning of the approaching maelstrom, those of you with 20, 30, 40 more years will see the totality of it. Year after year, region by region, strong evidence of climate change continues to mount. Yet, the deniers persist, driven more by political philosophy rather than by any understanding of science. Woe is America. We are becoming the laughing stock amongst the better educated nations of the world.